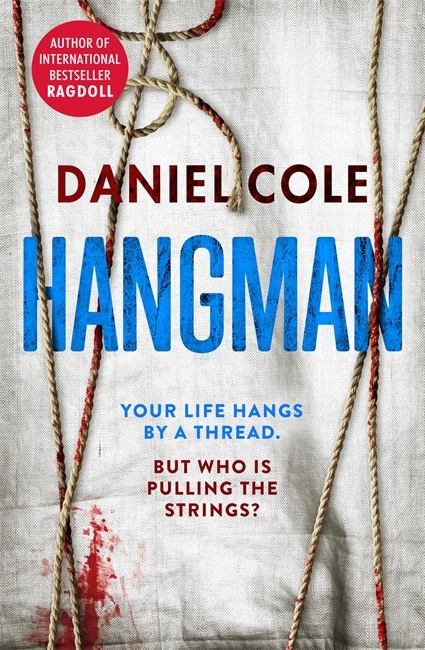 Hangman, by Daniel Cole, is the second part of the Ragdoll thriller trilogy. Hangman continues 18 months after the Ragdoll murders. The fallout from the case has seen Emily Baxter promoted to Detective Chief Inspector of the Serious Crime Command – making her one of the youngest (34 years old) female Chief Inspectors ever in London’s Met Police ever. Now a new and highly challenging case comes online, seemingly based on the Ragdoll murders and this time Baxter has to investigate in London and New York as murders are happening on both sides of the Atlantic. When a body is found on New York’s Brooklyn Bridge with the name of William Fawkes and the word “BAIT” carved into his chest it looks like a copycat killer is on the loose. This leads the FBI wanting to interview the Ragdoll killer in prison and brings Baxter into the investigation as she was the one the caught him. With bodies turning up with in London and New York with the words “BAIT” and “PUPPET” carved into their chests, Baxter is seconded to the FBI and teams up with CIA Special Agent Damien Rouche to hunt down a killer who is using others to kill for him. The killer is always one step ahead, but can they find him before his final act? Overall, I thought this was a fantastic follow up to Ragdoll. Ragdoll was brilliant and intelligent and I feel Hangman is much better. A multi-layered plot sees the damaged, irritable and extremely blunt Emily Baxter team up with the FBI and CIA in a thrilling, heart-pounding case that sees the body count racking up into the hundreds on both sides of the Atlantic. A well-written and extremely well-thought out story that along with the high body count also has humour interspersed throughout (with my favourite part seeing 3 Baxter and her CIA and FBI counterparts locked in a bedroom terrified of a spider). The characters are excellent. Each with their own flaws and demons the main characters of Baxter and Rouche and perfect together and you can’t help liking them, especially Baxter (even when you don’t want to). While this is the second part of the trilogy you don’t have to have read the first part to understand what is happening (although it would make the story much more enjoyable if you have). It works as a self-contained story very well. A fantastic, well told story that is riveting, thrilling and engrossing. Absolutely brilliant and highly recommended.